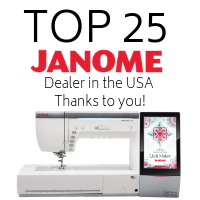 The Fabric Garden is an Authorized Janome Machine Dealer and Service Center since 1984. If you have any questions in advance of you dropping your machine off, please give us a call at (207) 474-9628 during normal business hours. Checklist of items to bring in with your machine. "A" utility foot or "F"
Take home a loaner machine (upon availability) so you can keep sewing.